At the beginning of the year Jessi and I set goals, which I shared. 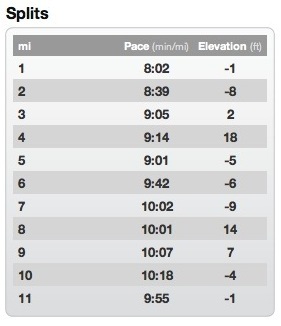 One of my goals was to run 10 miles in <= 100 minutes, or average at least 10 min/mi. The main reason for this goal was that we would be participating in the Disneyland Half Marathon and I didn't want to be completely burned out when we finished. As I wrote previously, we just finished it, and it was fantastic! 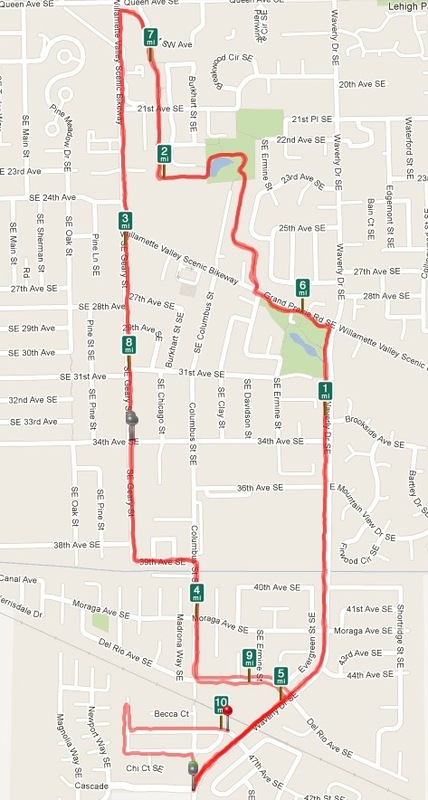 So, I decided it was time to do the official run to see if I could hit my goal. As the picture above shows, I did it: 10 miles in 95 minutes, or 9:25 min/mi. And what the elevation looked like. My pace stayed pretty consistent. It may look like big swings in elevation, but it's not. There's no scale on this, but the whole route is pretty flat, my guess is that there's at most 50 feet difference. Here are my splits. Clearly the first half was close to a 9 minute average. The second half was more a 10 minute average (hence 9:25 overall). Surprisingly, it's almost like I hit a wall in the middle of the 6th mile and immediately slowed down, but then stayed pretty consistent at that slower pace. The final chart I thought was interesting. This shows my weekly milage. As would be expected, I slowly increased the amount of miles I covered. 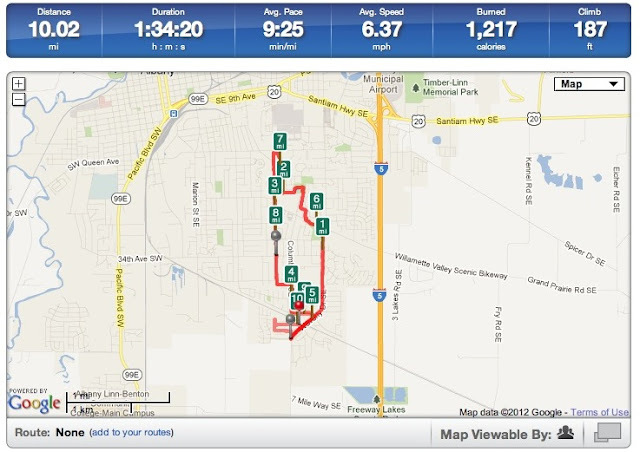 By the way, I used the RunKeeper iPhone app to track all of this (Website iPhone). It feels great to complete that goal. I'll probably continue running, but I'll keep it in the 5 mile range which I can easily do in an hour. I also ended up losing about 12 pounds since I started in May. Not a bad side effect at all.